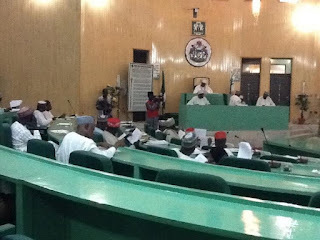 The Kano State House of Assembly has said that it was continuing with its investigation of the $5 million bribery allegation, despite an injunction by a Kano High court asking all the affected parties to maintain the status quo ante pending the hearing of the motion on notice. Chairman of the 7-man investigative committee, Hon. Baffa Babba Dan Agundi, disclosed the position of the House during a press conference at the Kano State House of Assembly, on Tuesday evening. According to him, following a meeting by the Assembly in the light of the court order, it was discovered that the court did not specifically ask the committee to stop or suspend the on- going investigation. He maintained that the committee would respect the court by entering an appearance on the matter, on Monday, but at the same time, it would not stop its work on the matter for the reason that it was not asked to stop. “There is no court order stating that this committee should stop its work. There is no such order based on the paper that was served this House. “So, if we are not mandated to stop by the court, if we continue with our work, we are not doing anything wrong,” he stated. “Had it been the court said stop this investigation this is very clear….. but there is no such order. They only said maintain the status-quo”, he stated. He assured that the House would be the first citizen to respect the rule of law adding that once the court comes out clearly to ask them to stop, they would stop the investigation. It could be recalled that a Kano High Court, presided by Justice Ahmed Tijjani Badamasi had, on Monday, issued an interim injunction stopping the on going investigation by the Kano State House of Assembly on the $5 million dollars bribery allegation against the Governor of Kano State, Dr. Abdullahi Umar Ganduje. The order of the court was sequel to a suit filed on by a legal practitioner in the state, Barr. Muhammad Zubair for himself and on behalf of a group, “Lawyers for Sustainable Democratisation of Nigeria”.